I wanted to make a loop antenna for receiving WWVB based on the Amidon R33-050-0750 Ferrite rod. This uses the type 33 material and is 1/2" diameter by 7.5" long. After trying a number of different windings I think the current version may be optimum for WWVB at 60 kHz. It's bank wound using 2 layers of 5x36x44 Litz wire. The following explanation of "Bank Winding" is for a 4 layer coil. "Bank Wound" means that you start the winding at the left end, then make 4 turns then wind backwards for 3 turns then forward for 2 turns and then backward for one turn. Now there are 4 layers of wire all at the left end. This process is repeated until the length of the rod is covered. The important fact about this type of winding is that the electrical distance from any one turn to it's immediate neighboring turn is is just a few turns. If the coil was wound a layer at a time, then the electrical distance between turns may be hundreds of turns. The self capacity of the completed coil depends on both the capacity between adjacent turns and also the voltage between the turns. If you look at the equivalent circuit for a single layer coil where the turns are spaced about one wire diameter it can easily be seen the the total coil voltage is divided so that 1/N of the voltage is across each turn-to-turn capacitance. That's to say the capactance is very closd to the capactance of the first to the last turn. But if you added a second layer then the two coil terminals are at the same end and the turn-to-turn capacitance for the turns adjacent to the two terminals has 100% of the coil voltage across it. The next turns away from the terminals has (N-1)/N of the full coil voltage, etc. This results in a huge self capacity. There are a number of effects that cause the A.C. resistance of a wire to be higher than the D.C. resistance. In a straight wire, with no other wires near by, as the frequency increases the electrons carrying the current move away from each other and so end up more and more near the surface of the wire and less and less along the centerline. Is similar to Skin Effect, but is caused by the interaction between wires that are near to each other. Litzenhardt wire is made up of a number of independent conductors that are insulated from each other. There are a large number ways that the strands can be arranged. The wire I used is made from AWG number 44 wires that are in bundles of 36 wires and there are 5 of these bundles in the final wire. If you needed a cable with 180 seperate wires you could use this Litz wire that way. Since a single # 44 wire has a diameter of 0.00198" the total area of the 180 wires is equivalent to a solid wire of diameter 0.02656", or between AWG 21 and 22. The problem is the insulation takes up space that could be used for copper. The result is that Litz wire typically only works well below a few MHz. It's interesting that at mains power frequencies (20, 50 or 60 Hz) the largest size single strand wire you can buy is determined by skin effect. If a load requires more square mills of copper area then you need to use multiple insulated conductors. MWS - Litz tool - input the AWG size to get the cross sectional area and it tells you the available strand count and wire sizes. The following plots were made using the HP (Agilent) 4395A in the Network Analyzer mode and using the Z Transform technique where the unknown device is placed in series with the center conductor. The problem with this winding is that it's very difficult to bring it to reasonance because of the difficulty in finding fixed caps of the exact value you need. A much better approach is to make the coil on a sliding former so tuning can be done simply by sliding the former. That's the way the commercial WWVB antennas are made. 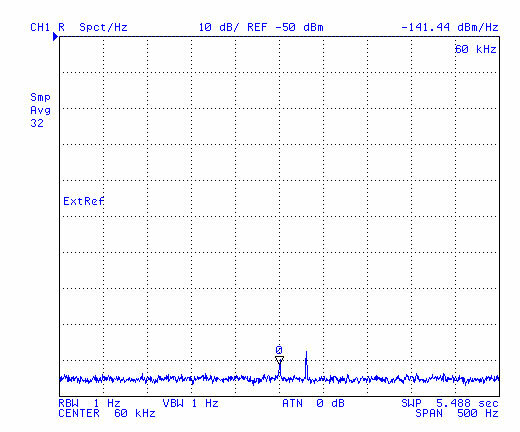 The marker shows 1.004 k Ohms at 32.960891 kHz. 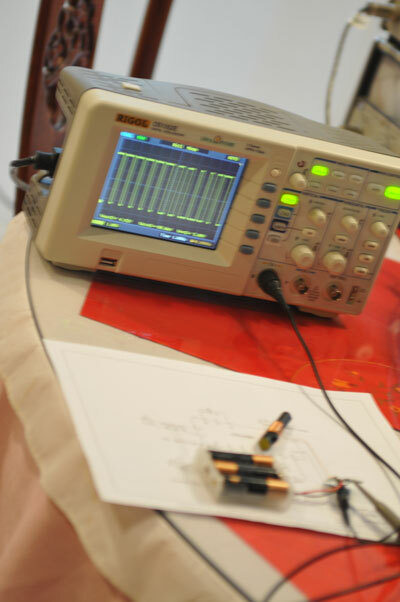 The network analyzer has already separated the real and imaginary parts so this is pure inductance. 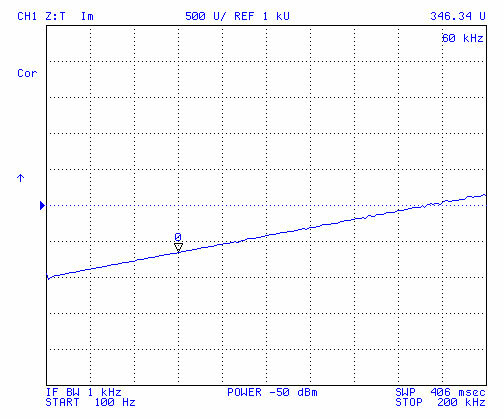 You can see that at 100 Hz the real part of the impedance is about 1 Ohm. i.e. the DC copper resistance. The marker shows the resistance has climbed to 29.325 Ohms at 60 kHz. Without making a plot of "Q" vs. frequency and analyzing the slope it's hard to say what's causing the resistance. It may be skin effect, proximity effect, or dielectric losses or some combination of these. Marker shows 94.308 dB at 62.485345 kHz. Ohms = 10 ^ (dB/20) = 51, 927 Ohms. 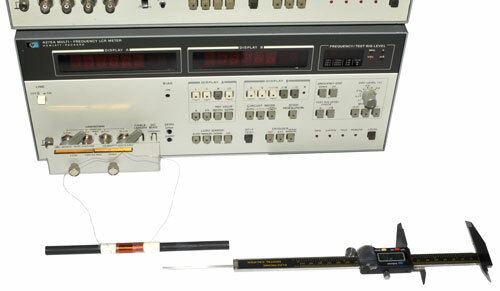 The HP 4332 LCR meter measured the caps at 1.35 nF. The loading capacitance value was chosen so that when the coil, caps and a small variable cap and the input capacitance of an amplifier are connected the resonance point can be brought right on 60.0 kHz. 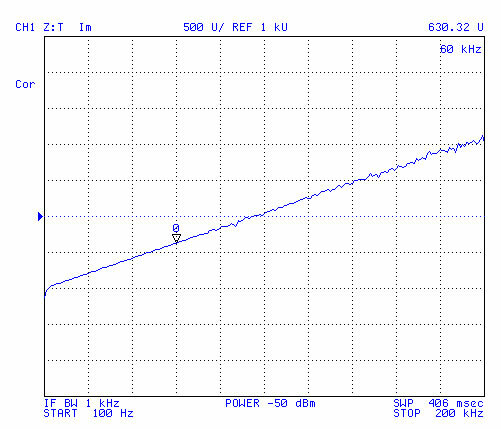 A similar plot of just the coil shows that it's self resonance frequency is very close to 500 kHz. That's good in that you don't want to run a high Q coil near it's self resonant frequency and here we are well away from it. This appears to be an improved version of the Temic LF time receiver chips. They specify the resistance at reasonance [40k to 100k for the CME8000 = (1/Q) * SQRT( L/C) ] of the loop for best signal to noise. They have an antenna design - tool to help. The Q should not be between 40 and 150 for the CME8000 if higher temperature effects may tune the cirucit out of reasonance. Note that they have a single IC that can be used with a single loop antenna and by switching caps will tune to LF time stations at 40, 60 or 77.5 kHz and knows how do decode them. The above loop with the caps that are installed has a resistance at reasonance (60 Hz) of about 52 k Ohms. The reasonating cap should not be an X7R type since they change capactance up to 10% during soldering. 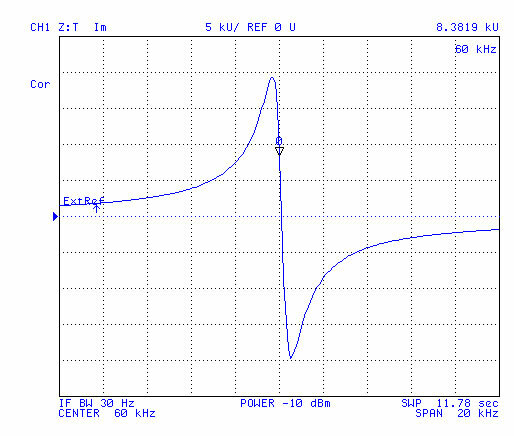 The desired loop would be 1.5 mH for WWVB and the cap would be 4.7 nF with a Q of 100. To get the above coil down to 1.5 mH would require removing a lot of turns which would reduce it's series resistance increasing the Q, probably to way over 100. Then either a fixed resistor can be added to control the Q or the reasonating capactance needs to be designed to track with temperature. C-MAX has an app note on the choice of resonating caps. In order to get surface mount caps they have gone with multilayer ceramic cape. But that makes for a big problem. If the wrong type is used there will be large permanent changes in the capacity because of the soldering operation (maybe measure cap first then use silver epoxy for attach?). For the loop above I used a combination of mica caps and a variable cap to tweak the total. When the loaded Q is high there can be a problem with temperature causing the center frequency to shift to the point the received signal drops. 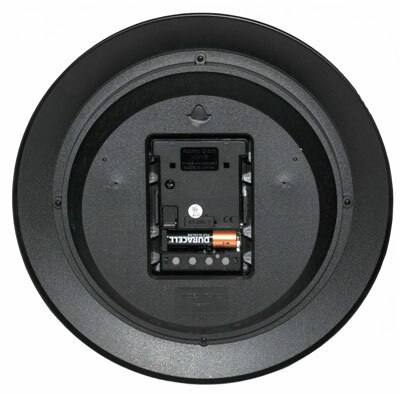 For most commercial applications the Q is limited to 120. There is an upper limit on Q imposed by the signal bandwidth. L.F. time code stations use a modulation that changes once per second so a bandwidth of say 10 Hz would be plenty. This implies that at a Q of 6,000 you will start reducing the modulation. But the C-max limitation of Q<=120 comes from temperature stability. In the photos above remember that my loopstick is 7.5" long and the CME module is only 2.5" long. It's interesting that both of the ICs on this module were made by Atmel. The 3 station LF time receiver is the Atmel CME8000 and the micro controller is the AT89LS52 (8051 based) driven by a 11.0592 MHz crystal. They make a number of different versions of the LF time signal board and all those that have an on board RS-232 chip, like the MAX232, can NOT be used in real time because the switching noise of the RS-232 chip for generating the negative voltage is many 10s of dB higher than the received LF time signal. The model shown here was chosen because it has only TTL/CMOS outputs, i.e. does not have the RS-232 chip on the board. The CMMR-6P-60 is the 60 kHz version (they also offer 40 kHz and 77.5 kHz versions) for WWVB. It's based on the C-MAX CME6005 which is the analog front end without a CPU. The C-Max data sheet has a table calling this the CME6005 w/o CPU and that's the way Digi-Key has listed it. But it's really an evaluation kit for the CME6005 and comes with an attached (and tuned) 60mm x 10mm loop stick antenna. The C-max bag has a sticker "Tested Sample". 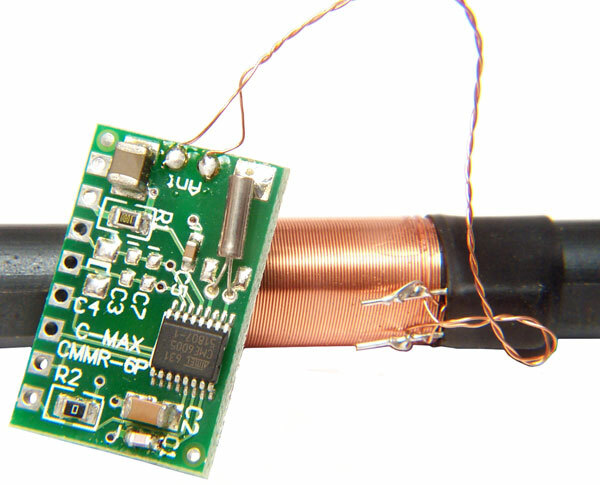 This is important because of the difficulty in tuning the antenna to reasonance using surface mount caps. Notice that the wire between the antenna and PCB is twisted. That is required to minimize interaction between the magnetic field caused by any digital circuitry and the very low level input signal. Note there is a through hole type cap on the loop stick and in addition there are pads on the board for C4, C3 & C7 to reasonate the antenna. Since those three have no cap installed it's clear that the thru hole cap attached to the antenna is resonating it at 60 kHz. A method to do that is described in the CME6005 data sheet. The cylindrical package is a 60 kHz series resonant crystal acting as a filter. It's possible to connect two crystals in parallel (and two of the three frequencies and this board would then output the time code for whichever station was within reception range. But C1 and C2 may need to be different values for different stations. This circuit operates on 1.2 to 5.5 volts aned draws about 100 uA. That means all inputs and outputs are very high impedance. 13 Jan 2009 - have a receiver module powred at 3 V and a DMM watching the output (1 second per bit should be visable) but so far the output is between 2.9 and 3 V. Maybe later tonight it will start working. Looking with a scope shows pulses about 4 us wide at random times. The outputis mostly at +3 V and the pulses go to 0 V. Using a GPS receiver to supply a trigger pulse once per second confirms that the narrow pulses from the CMMR-6P are not correlated with the time. The gaps in the bottom part of the trace correspond to the time code. But they are not solid. by 7:23 about the same, dots, not solid at the bottom. This is connected to TCO and not working very well. Maybe there was a wiring probllem? Changed from powr supply to battery operation and added LED and resistor to monitor. First connected LED to the TCO output, but that means the LED is normally on all the time draining the batteries and it didn't seem to work very well. Connecting the LED to the logic inverted output TCON works better and saves the batteries. This is a very handy gadget in that you can take it to different places to see how well it works. Put in the bedroom at night you can see that the data is more solid, but far from noise free. Next to put a scope on TCON. A couple of wires were soldered to the board so that other antennas can be connected. The unit shown at left did not have solid blinking of the LED but the unit built in Octobeer 2010 does have solid LED blinking 24/7. See video below. Graphic displays, both CRT and LCD, emit radiation because of the scanning and modulation signals. When testing the CMMR-6P-60 using the Rigol scope if the receiver gets too close to the screen the data is totally garbled. When the scope is close to the receiver the data is corrupted. Moving the receiver away from the scope solves the problem. In a real application if the receiver is near electronic equipment there may be a similar problem. A Nikon D300s camera when close also corrupts the data, discovered when making the video below. My first testing with a LED directly connected to the CMMR-6P-60 showed noise during the daytime, but around local midnight the flashing was a solid one pulse per second. 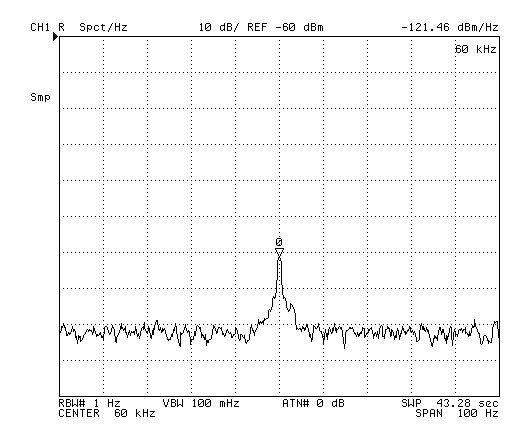 In Oct 2010 with a different CMMR-6P-60 I'm seeing no noise 24/7. There are two differences, now there's a resistor in series with the LED to limit current (make the battery last longer) and I'm using three AA cells (make the battery last longer). I notice that the K5JHF clock, just below, did not sync up as soon as it was powered up at 3 pm but did sync around midnight. 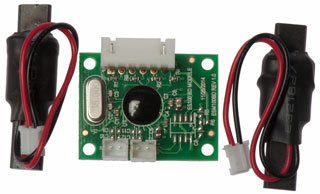 It uses two AA batteries and the receiver output drives a micro controller input pin that's very high impedance. That seems to say the receiver wants to run from about 5 VDC and not from two AA batteries. 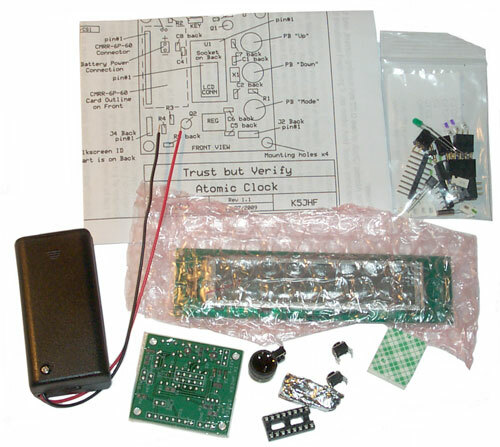 This is a kit to make a clock based on the CMMR-6P-60. Shown below as received. 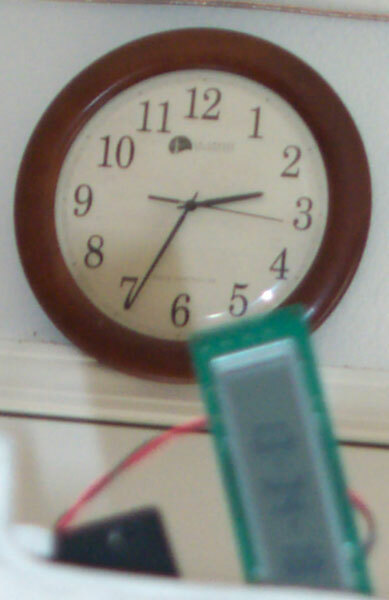 Note: This clock DOES NOT make the DST/ST switch automatically, i.e. there's a software bug. flashes along with the CW. 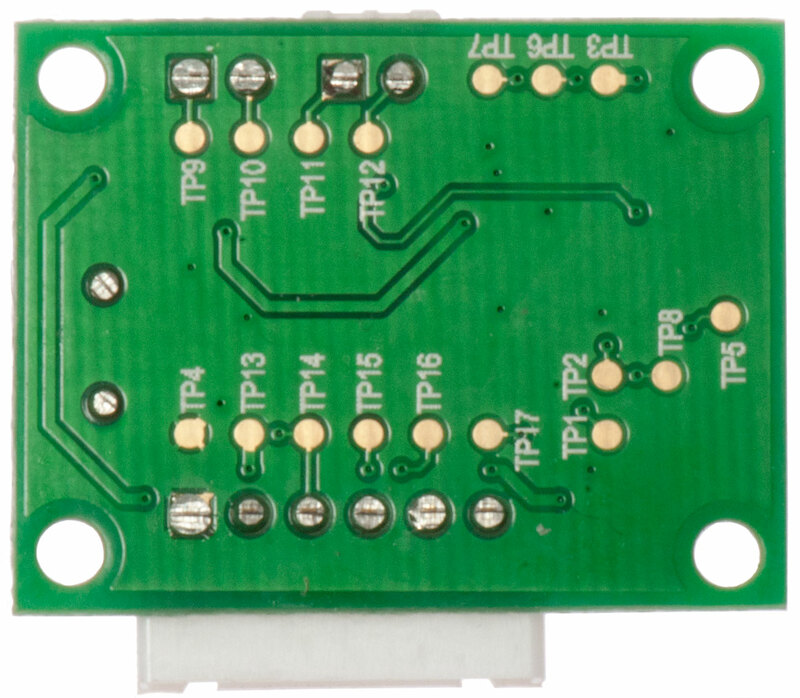 This kit makes use of some surface mount parts but is straight forward to hand assemble with a soldering iron. But there's one gotcha. The2x5 header for the LCD is located inside the 2x8 DIP socket for the micorcotroller so you have to install the 2x5 first then the 2x8. Also be sure that pin 1 on the LCD matches pin 1 on the kit PCB. The piezo has seperate "Tic" and "Toc" sounds that are cute. Now, where did I put the CMMR-6P-60? Got another CMMR-6P-60 from the maker of this clock kit. When first powered on around 3 pm local time the clock did not sync, but did sync around midnight, but ever since it has not displayed any starting letter when I've checked. I'll be checking closer to noon to see how it's doing. This means that the clock lost lock at 5:02 am this morning, but no first letter has appeared since so am confused how they work. This menas the clock has NOT synced for a few days. The time show is 12 seconds slow. 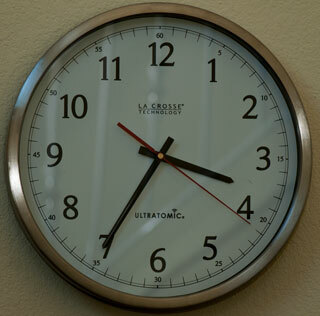 This photo of the clock running a little before noon shows no prefix letter. Note I have assembled the kit so that the setting buttons are facing the same direction as the LCD face to make it easy to operate the buttons. of 14:34:16, but . . . The K5JHF clock is displaying 13:34:19, i.e. there's a 1 hour error. The Heathkit GC-1000 WWV clock has a similar problem in that it makes the DST/STD time swtich when the station in Colorado changes, not in your time zone. 10 03 14 05 03 59, so it was in sync early this morning and so the problem is a software bug, not a lack of sync. 25 Oct 2010 - Since the Rigol scope was being used to investigate the CMMR-6P-60 antenna a quick look at the K5JHF clock confirmed that the Pon pin was grounded and to check for digital interference. If the loop is brought close to the micro controller PCB the data gets garbled. But when the loop is as far away as the short wires that come with the loop stick antenna the noise is gone. For most applications seperating the loop stick from any digital electronics by say 6" or more might be a good idea if you don't have a scope to check for interference. "Large Balun Ferrite Rods 10x200mm"
They are very similar to the 7.5" rod above, but this time I'll make provision to tweak the resonant frequency in a simple manner. After cutting the tape each rod needs to be cleaned of tape residue. Rods measure: 9.75 mm (0.383") dia x 199..2mm 7.846" long. Making coil former from 67 # paper. Wrapped a little more than one turn then glued and tapped. Rod slides easily in and out of former now. The hope is that it will also slide on the rod after the coil is wound on it. Note that if ordinary 20 # copy paper was used the wire tension would lock it to the rod. L = 392 uh = 0.392 mh without the ferrite rod inserted. relative permeability = 25.62 mh / 0.392 mh = 65.4. 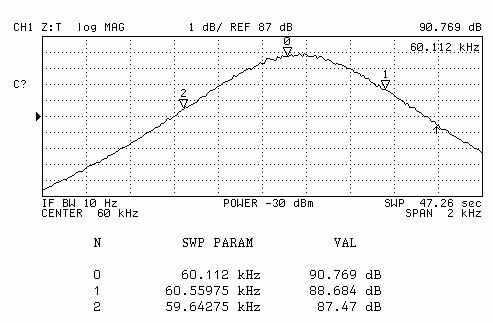 Measured at 40 kHz with 1 ma current in coil. Note: a Q of 150 is a single count from a Q of 150. Shown below are the 750, 60 and 120 turn coils. 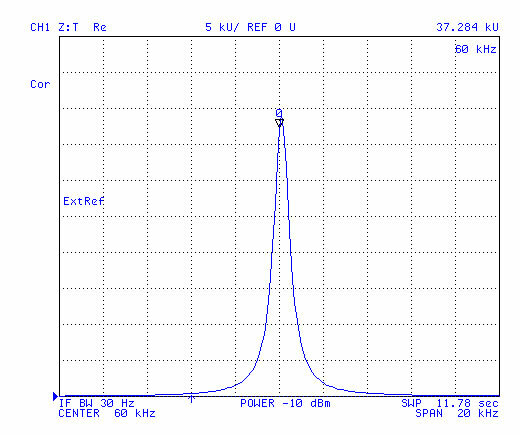 The 120 T coil has been adjusted to reasonate at 60 kHz with the 4n7 cap.. It would work a little better if turns were removed so it was closer to the center. First cut would be 1.5 mh/ 65.4 = 22.9 uh. H = since L is proportional to N^2 reducing the inductance from 25 mh to 22.9 uh requires a change in turns of 33. H = 0.0095 * 23 = 0.216"
L = 422 uh & Q = 63 with coil at center of core. 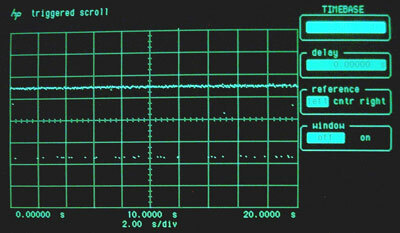 Self resonant frequency with ferrite core is about 2.3 Mhz. i.e. well above 60 kHz. HP 4274A LCR Meter measuring 160 turn Loop antenna. It looks like a few turns can be removed to improve the Q at 1.5 mh, but the next step will be to sweep the inductance on the HP 4395A. 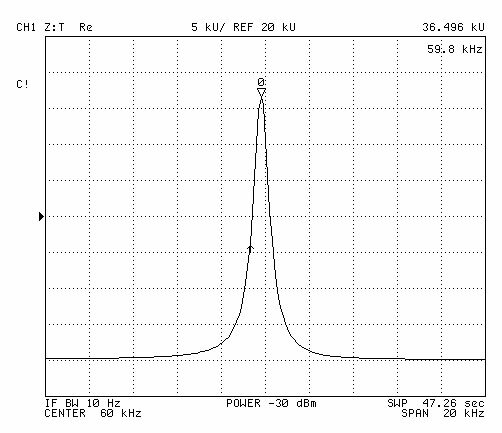 A 4n7 cap has an impedance of 564 Ohms at 60 kHz. If the real resistance of the tank at 60 kHz is 37.3 k Ohms then the Q is 66 which is about half the Q from the 4274A LCR meter at 40 kHz. 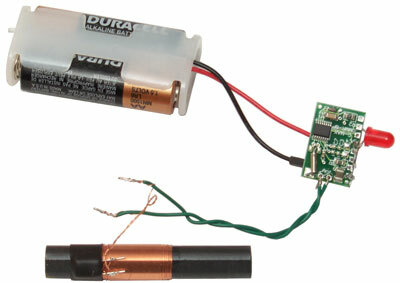 Tank circuit connected directly to 50 Ohm input. When a Galleon 60 x 10 mm 60 kHz resonant loop-stick was connected to the exact same setup, after 32 averages there is no signal at 60 kHz so the 200x10 mm Russian ferrites make better antennas. I think the antenna performance metric should be G/T, i.e. the ratio of the Gain to the noise. C-Max says that too high a Q leads to temperature instability. The other factor is the impedance at reasonance, i.e. related to the value of the resonating cap. The cap needs to be larger than the coil's self capacitance in order to get a high Q value, so miniumzing the self capacity of the coil seems like a good thing. turns over 2.27" spaced apart. aprox 100 turns. Measured on 4275A at 40 kHz shows 0.952 mH and Q of 92. Self resonant frequency with ferrite core is about 4.8 MHz. because the turns had not been counted. It was in Photoshop that it was determined to be really a 131 Turn coil. An extension wire was soldered to the above 120T loop antenna and about 30 more turns were wound (to the end of the former. Then it was measured on the HP 4275A LCR meter showing about 2.4 mH. Turns were removed until it measured about 1.5 mH with a Q of 235 at 100 kHz. Then put onto the HP 4395A in Z:Trans mode (RF OUT & A input) with the same 4n7 cap as before and the former moved until resonance was at 60 kHz. This turns out to be very difficult at this high a Q so a fine tune can be made be tuning a little high then winding on a fractional turn. Then one wire was opened between the loop and the cap to make a series circuit and that was connected to the 4395A in spectrum analyzer mode (R input). This is about the same real impedance as the above close spaced 120Turn loop. Which is consistent with using the identical 4n7 resonating capacitor and the same 32 AWG wire. 21 Oct 2010 - When soaked in the freezer (zip lock bag) overnight and tested next morning the peak was at 62.5 kHz. The cap was out of the bag and quickly came to room temp. Much better to use the C-Max method of using shrink tube to hold the cap next to the ferrite. Have a bunch of caps of different chemistry on order to see what tempcos are available. where Fhi and Flow are down 3 dB from the peak. But this may not mean much considering the source and load resistances. The loop and cap are series connected for this spectrum plot. Taken at 9:30 am 19 Oct 2010 in my office, i.e. near a working computer and during the day. The signal is WWVB 20 dB above the noise!!! To make the noise easier to see the video bandwidth has be lowered to 0.1 Hz rather than use averaging. The improvement may be because of the series LC connection, the spaced turns covering more of the ferrite or reducing the self capacitance, or something else? Oct 22, 2010: Some more of the CMMR-6P-60 WWVB receivers have been received so that a number of receivers can be tested in parallel with different loops. The first test will be to compare the stock receivers to see how similar they are with the stock loop antennas. Then replace one of the stock antennas with the 131T antenna and see what difference it makes on the output at different times of the day. So far the first stock receiver is producing strong output all the time. 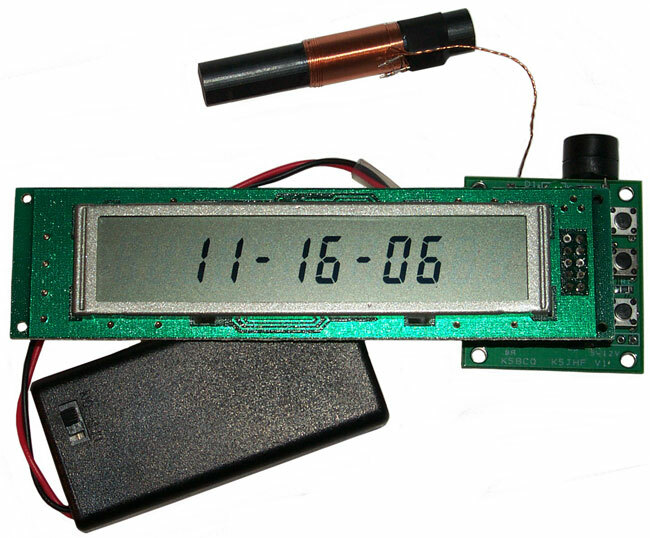 The CMMR-6P-60 WWVB Receiver is shown for just over one minute, a full digital data frame and in the background you can hear sharp ticks that are coming from another WWVB receiver. In another room is a Self Winding Clock Co. "Western Union" pendulum clock that can also be heard. The red LED is fed through a 4k7 resistor and the receiver is being powered by three Alkaline AA batteries (about 4.5 Volts). There was a problem making this video in that when the Nikon D300s was close(4" or so) to the CMMR-6P-60 the receiver quit working. In order to make the video I used a 2X tele extender so that the camera could be about a foot from the receiver. Recorded 25 Oct 2010 at about 0913 to 0914 Pacific Daylight Time (1613 to 1614 UTC). * 4.7 nF is the cap that C-Max uses on their antennas. Dwire = 7.874" /SQRT(f) = 0.032" which is 20 AWG. So using a larger wire diameter in solid copper should improve the Q and lower the resistance of the coil. The skin depth in copper is about 10 mills. Note 32 AWG is about the wire size C-Max uses. If a free running 32 kHz oscillator was enclosed in a combination of thermal mass and insulation where the time constant was much longer than a day then the daily temperature variations would not be such an influence. To get a feel for how big a mass and what insulation that represents some experiments follow. A brass rod 1/2" dia by 3 3/4" long weighing 102 grams is heated in the oven, removed and lightly wrapped in a towel. The time and temperature are recorded. The time for the temp to drop by 1/e is 6 min 35 seconds. So to get a multi-day time constant would take much more mass and much better insulation. 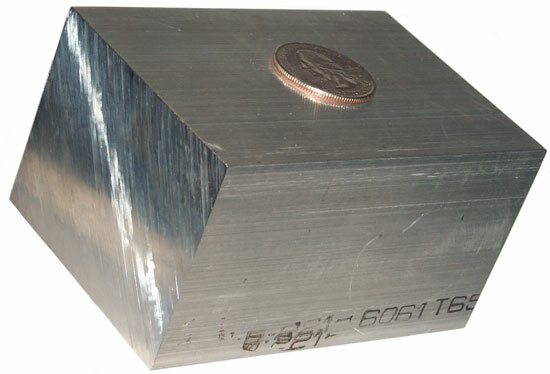 Block is 6061 3.362" x 2.500" x 2.000" (16.81 cu in or 275.5 cc) and weighs 1 # 12.4 oz (805 grams); 2.92 g/cc or 1.68 oz/cu in. Styrofoam Insulation is sold by Michael's Arts & Crafts store. 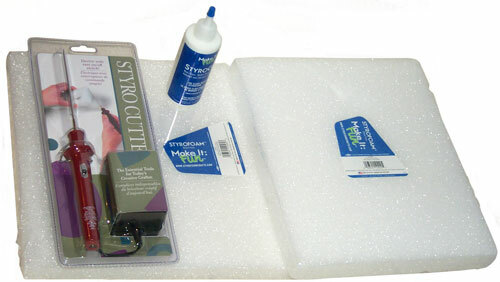 Branded as "Make It: Fun!" for floral arrangements. 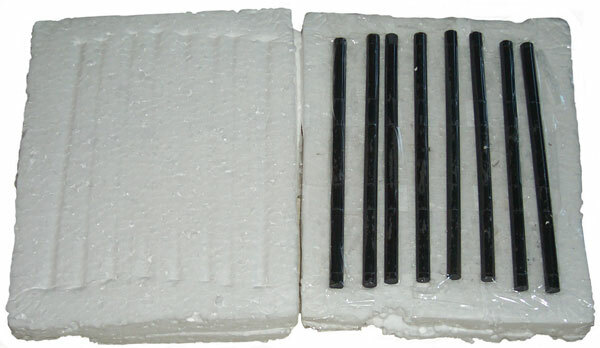 B10125WS 1-3/16 x 9-7/8 x 11-7/8 inch (3 x 25 x 30.1 cm Styrofoam Block weight: 2.6 oz (73.7 g) 0.0325 g/cc or 0.0187 oz/cu in. Styro Cutter Model No. 601+ nominal hot Rod ( a hot wire is supported at both ends so can not cut trenches, but a rod can) kerf is 1/16"
The wall wart is rated at 6 VAC & 500 ma for a power of 3 Watts. This means that it cuts very slowly, not recommended. The Hot Wire Styrofoam cutters on You-tube are using much more power and cut at a more reasonable rate. Also it's easy to bend the rod over if you try to cut too fast. Looks like Elmer's wood glue. After one hour still not starting to set. No info on the bottle about set time. Some faster way would make doing an assembly much easier. Notice that the denisty of the Styrofoam is about 90 times lower than Aluminum. 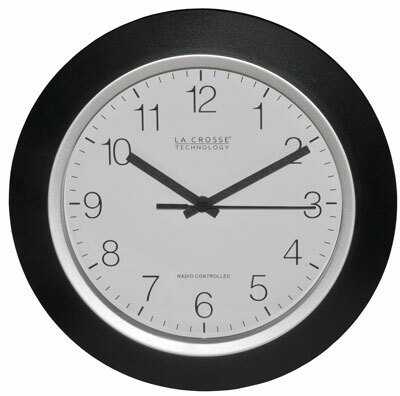 This is a newer generation WWVB clock compared to the earlier ones. It syncs much faster and it rotates the hands very fast for the daylight savings time change. But it probably is not making use of the new phase modulation. This is the newest WWVB La Crosse clock that receives the phase modulation. I powered it up around noon and within 5 minutes is was synced. This is the chip used in the La Crosse WT-3102 WWVB Clock above that received the phase modulation signal. WWVB is upgrading their transmission so that receivers on the East coast will be able to synchronize even with a weak RF signal strength by adding phase modulation. The old constant phase (except for the small phase step) is not gone so receivers that locked to the carrier phase, like the HP 114 and a bunch of other frequency standard receivers will no longer work in stock format. There's talk of a circuit that can be added between in input and receiver that will remove the phase modulation and do that without the degradation in signal to noise ratio that a squaring circuit introduces, but I haven't seen one yet. http://www.nist.gov/pml/div688/grp40/wwvb.cfm is the NIST web page talking about the new phase modulation format. http://www.nist.gov/pml/div688/grp40/upload/NIST-Enhanced-WWVB-Broadcast-Format-1_01-2013-11-06.pdf is the paper, but does not cover all the different formats. WWVB Time signal Broadcast: An Enhanced Broadcast Format and Multi-Mode Receiver, Liang, Eliezer, Rajan & Lowe, IEEE Communications mag. May 2014. This paper goes into some detail about the different frame length messages. There are a number of references with links. Y. Liang, D. Rajan, O. Eliezer, “Receiver Design of Radio-Controlled Clocks Based On The New WWVB Broadcast Format,” IEEE Trans. Wireless Communications, accepted for publication. Y. Liang, O. Eliezer, D. Rajan, and J. Lowe, “WWVB Time Signal Broadcast: An Enhanced Broadcast Format and Multi-Mode Receiver,” IEEE Communications Magazine, vol. 52, no. 5, pp. 210–217, May 2014. Y. Liang, O. Eliezer, D. Rajan, A. Ramasami, W. Khalil, “Interference-Robustness Improvement in BPSK Receivers for the Enhanced WWVB Broadcast” in IEEE Texas Symposium on Wireless and Microwave Circuits and Systems, April, 2014. Y. Liang, D. Rajan, O. Eliezer, S. Balasubramanian, and W. Khalil, "A New Broadcast Format and Receiver Architecture for Radio Controlled Clocks," in IEEE International Midwest Symposium on Circuits and Systems, pp. 1128 - 1131, August 2013. Y. Liang, H. Liu, and D. Rajan, “Optimal Placement and Configuration of Roadside Units in Vehicular Networks,” in IEEE Vehicular Technology Conference, pp. 1–6, May 2012. Y. Liang, O. Eliezer, and D. Rajan, “Optimization of Cosine Modulated Filter Bank for Narrowband RFI,” in IEEE GLOBECOM, pp. 1-5, December 2011. O. Eliezer, T. Jung, R. Lobo, M. Appel, Y. Liang, D. Robbins, and P. Nelsen, “A Multi-Mode Software-Defined CMOS BPSK Receiver SoC for the Newly Enhanced WWVB Atomic Clock Broadcast,” in IEEE Radio Frequency Integrated Circuits, June 2014. J. Lowe, M. Deutch, G. Nelson, D. Sutton, W. Yates, and P. Hansen, O. Eliezer, T. Jung, S. Morrison, Y. Liang, D. Rajan, et al. 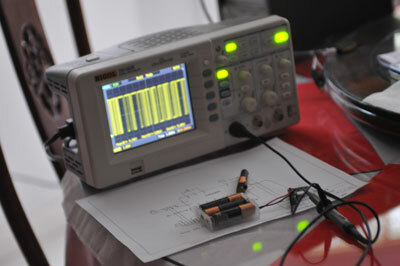 “New Improved System for WWVB Broadcast," in 43rd Annual PTTI Meeting, 2011. Y. Liang, D. Rajan, O. Eliezer, “Sequential Frame Synchronization based on Hypothesis Testing with Unknown CSI,” Manuscript in preparation. Y. Liang, D. Rajan, O. Eliezer, “Design of Non-linear Block Codes Given Unequal A-priori Message Probability,” Manuscript in preparation. Y. Liang, D. Rajan, O. Eliezer, “Design of Sync Word Given Unequal Energy per Bit,” Manuscript in preparation. Many of these have some amount of duplication. 8331201 Leap second and daylight saving time correction for use in a radio controlled clock receiver, Oren E. Eliezer, Xw Llc, Grindstone Capital, Llc, Xw Llc Dba Xtendwave, Dec 11, 2012, 368/47, 375/329, 375/316, 368/28 - "The one second/one hour corrections are scheduled to occur when they should take place and the correction is applied exactly when DST or leap second is to go into effect, without having to receive anything around the time of the correction." 8300687 of the same name but issued Oct 2012? The phase modulation system is similar to the one used on the German DCF77 time station, so a receiver that works for it might be modified to work with WWVB. Blikenlight - The Clock - by Udo Klein in Germany a DCF77 receiver shield for Arduino. The hardware front end is a commercial module (the larger the loopstick the better). LORAN-C Receiver by Poul-Henning Kamp - an improvement would be to band limit the loop antenna, but not high Q since sferics will cause ringing. MSF Radio Receiver - the MSF signal suffers the same problems as the WWVB signal. Projection clocks including a WWVB version. [an error occurred while processing this directive] page created 22 Sep. 2003.